When a new rabbit-eared race called Viera was revealed for Final Fantasy XIV’s upcoming Shadowbringers expansion during last month’s Paris Fanfest, only female versions were shown, but players were hopeful that the male version of the Viera would be announced at the Tokyo Fanfest this past weekend. Instead, Square Enix added a whole new race, the exclusively male Hrothgar. So, now there are two gender-locked races instead of one. Great. Introduced in Final Fantasy Tactics Advance and popularized by Final Fantasy XII’s Fran, the Viera are a race of tall, lanky bunny people. According to lore, male Viera exist but they live in separate settlements and do not appear in public. In a recent interview with GameSpot, Final Fantasy XIV producer Naoki Yoshida cited this lore as the reason why playable Viera can only be female. But the lore hasn’t stopped players from clamoring for and anticipating the reveal of playable rabbit boys. When asked about the possibility of male Viera during a Q&A session at the Paris Fanfest last month, Yoshida said he could not comment and that players would have to wait until this weekend’s Tokyo event for more information. Many took that comment as confirmation male Viera would appear. They did not. 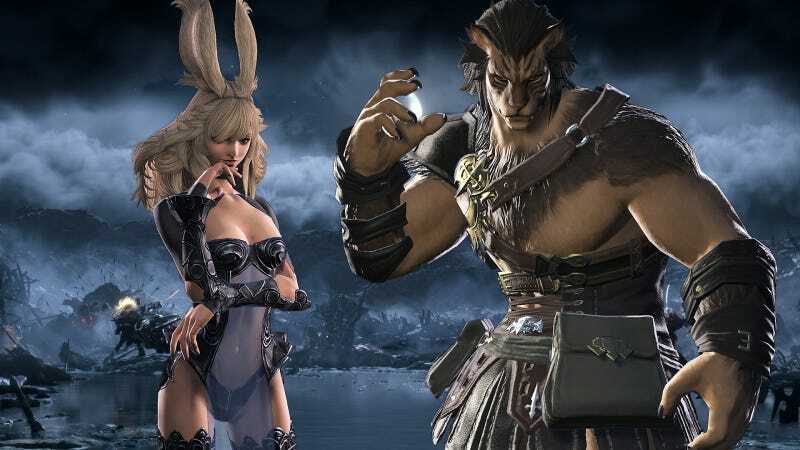 Instead of playable male Viera, Yoshida introduced the male-exclusive race Hrothgar. Modeled after the bestial Ronso from Final Fantasy X, the Hrothgar are thickly-muscled cat men, some of whom sport horns à la FFX’s Kimahri. While Final Fantasy lore features both female and male Ronso, in Final Fantasy XIV they will be a male-only race, included as a counterpart to the female-only Viera. Now fans are outcrying again. Reddit threads about the new race reveal (thanks to reader Connor for bringing these to my attention) are filled with angry comments. There’s an extensive fan-created poll gathering data about how players feel about the gender-locking, and how it affects their feelings about July’s Shadowbringers expansion. Fortunately, director Naoki Yoshida told GameSpot the team is taking player feedback under consideration. The developers have a good track record when it comes to dealing with players’ complaints, like their approach to fixing issues with player housing, or their response the first time Final Fantasy XIV had a pair of gender-locked races. Let’s hope players don’t have to complain too loud and long, and I can get my bunny boy on sooner rather than later. What Is the .NET Framework, and Why Do I Need It?